It's a marketer's most important task, yet most say their lead generation efforts do not enable them to reach their goals. 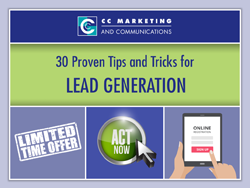 If you wrestle with generating leads, our e-book features proven lead generation strategies -- it doesn't matter what business you're in! Tell your sales team to get ready... because you're about to start generating more and better quality leads. Get your free copy of this idea-packed resource today!